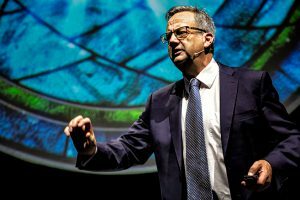 David Wells, a keynote presenter at this year’s Catholic Education Convention in Wellington, speaks to WelCom about Pope Francis’ latest exhortation, Rejoice and be Glad. ‘Faith seeks understanding’ St Anselm famously taught. Since then the Church has possessed within her treasure chest a growing library. Rightly so; where would we be without it? As GK Chesterton asserted, without orthodoxy, each generation would start again, rediscovering what has already been revealed in a merry go-round of returning to ‘go’. There is another risk though. Unconsciously we can regard the understanding that St Anselm spoke of as faith itself. Such knowledge by itself is redundant. Without virtue, words stay in our heads and make little impact in our hearts or upon our actions. Pope Benedict put it succinctly; without love our relationship with God ‘Becomes merely proper but loveless’. In his latest exhortation Pope Francis reminds us that our faith should arouse in us great joy and deep compassion. Without these virtues we will fall into the traps of focusing too much on the things we know and the things we do. Gratitude is lost behind the attention we give to our own contribution. Rejoice and be Glad offers us several tips to help ensure our faith stays fresh and enjoyable. Here are three of them. The first is to rejoice. When we rejoice we are focusing on the love and compassion of God. We are taken out of our obsession with our own limitations and achievements. To rejoice means to put down all the anxiety we’ve accumulated and focus on the love God has for us. This encourages cheerfulness. Second, we don’t have to be afraid of being holy. To be holy is to be truly our self. We don’t have to look, sound or behave like someone who appears religious. Our holiness is to become the person we were created to be from the beginning of time. Thirdly, our lives are already holy. When we look at our lives this way, our daily routines become imbibed in God’s presence and new significance opens-up for us. Holiness is not confined to the sanctuary or to theology courses, but extends outwards into the kitchens, waiting rooms, and rush hour traffic of our messy lives. The trick is to see our daily routines as an encounter with God. Don’t be afraid of being holy…. If we can begin to act out these simple truths we will begin to feel and then think differently. We will find the happiness God intended for us. So… try these tips and stop looking like you’re sucking a lemon!